Moravian G3-16200 monochrome CCD camera uses KAF-16200 sensor with 4540 × 3640 pixel resolution, big sensor 27.2 × 21.8 mm and Anti-Blooming: perfect for astrophotography. This model has an internal filter wheel that accepts up to 5 50,8mm filters. The powerful cooling system allows to stabilize the CCD sensor temperature up to -45°C with respect to the ambient temperature to reduce the electronic noise. Also available with class 1 sensor, the G3-16200 camera uses a mechanical shutter. Large format CCD cameras of the G3 series are designed for up to 24x36 mm (photographic “full-frame” format) CCD detectors. G3 series inherits from G2 cameras — camera handling, software control, power supply and connection to the host PC using fast USB interface is the same. Design of both series is very similar and although G3 camera head is naturally bigger, it contains all mechanics and electronics and offers only power and USB connectors. As like in the case of G2 cameras, G3 head contains mechanical shutter and optional integrated filter wheel for five 2-inch filters. Read noise is also limited only by CCD itself so G3 series surpasses competing products. Precisely regulated cooling achieves detector temperatures 45°C below ambient temperature. Lowest possible read noise, limited by CCD detector itself. 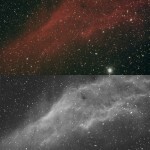 High dynamic range, 16-bits digitization. Efficient and precisely regulated cooling with optional heat exchanger for liquid coolant. Compact camera head, small and lightweight enough to be attached even to small telescopes. Integrated all-in-one design with USB and power connectors directly on the camera head. Integrated mechanical shutter not to bother with covering the telescope when taking dark frames. Single-voltage power supply enabling operation from 12V battery or “brick” adapter. Robust construction to sustain every-day usage. G3 camera head is designed to be easily used with a set of accessories to fulfill various observing needs. 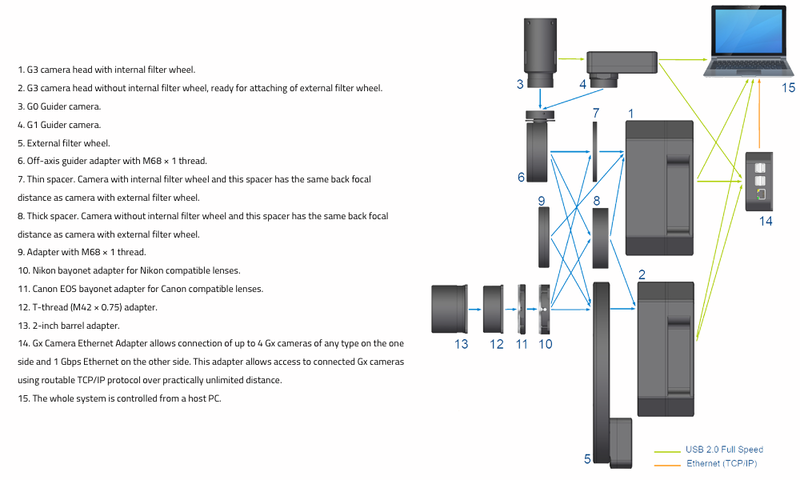 Camera head itself is manufactured in two different variants: camera with internal filter wheel and camera with control port for external filter wheel. This model allows attachment of several variants of external filter wheels with various number of filter positions and sizes. Camera head and numerous accessories comprise imaging system, capable to be tailored for many applications. Powerful SIPS (Scientific Image Processing System) software supplied with the camera allows complete camera control (exposures, cooling, filters) with automatic sequences and complete image calibration. 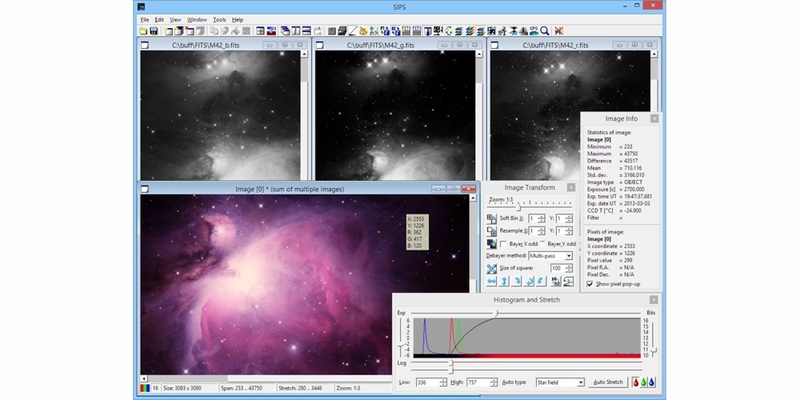 SIPS also supports advanced tools like Image Add tool with automatic sub-pixel image alignment, (L)RGB Add tool, Image Blink tool, image filters and many more functions. Drivers for ASCOM standard as well as native drivers for third-party software are also available (e.g. TheSkyX, MaxIm DL, AstroArt, etc.). Camera body with telescope adapter. 12V power unit with 1.8 m long power cable. 5 m long USB cable for connecting camera to PC. USB Flash Drive with camera drivers, SIPS software package and PDF version of User's Manual.